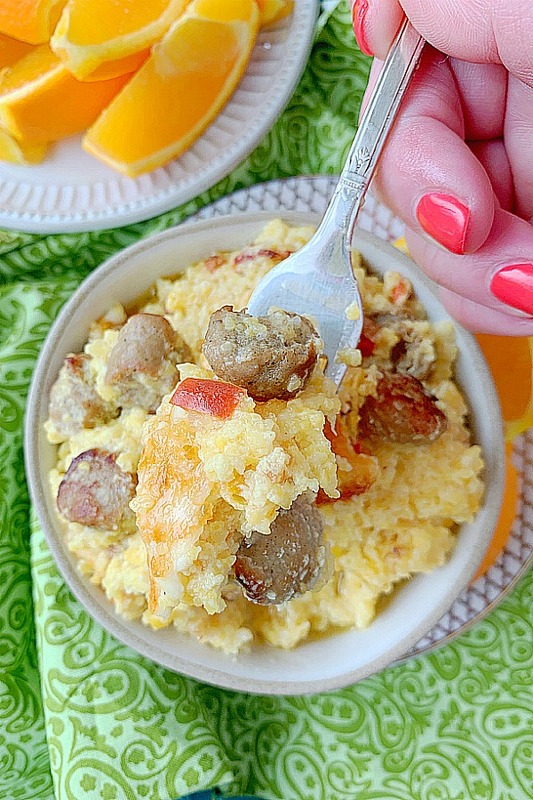 Bring a taste of the South to your table with this Loaded Grits Breakfast Casserole. I love cheesy grits. As a side dish and as a main dish for breakfast or brunch. They’re terrific for entertaining. 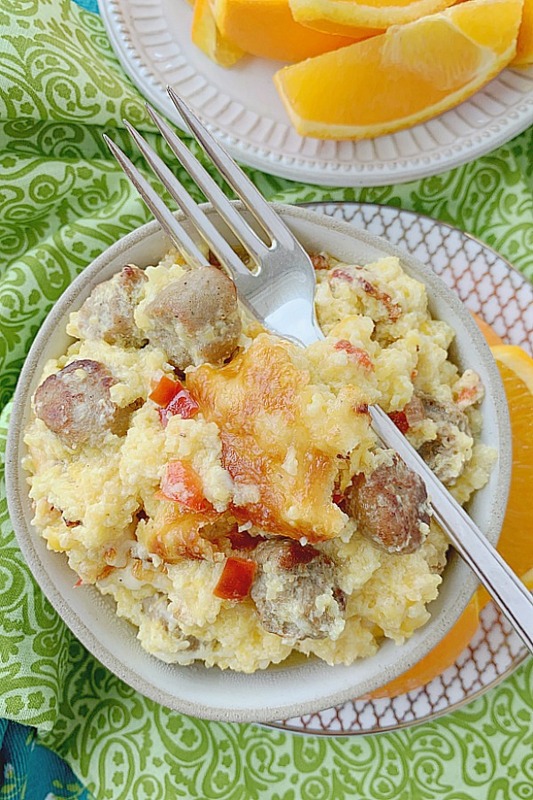 This Loaded Grits Breakfast Casserole includes bacon, turkey sausage links, onions and peppers plus lots of cheese. Make it the night before and bake it the morning of a brunch at your house – for Easter, Mother’s Day or just a regular Saturday or Sunday. 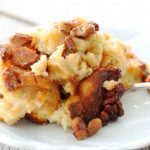 It’s simple, delicious, filling and since the base is corn grits, it’s gluten-free (for those of you that need to be). Grits are simply crushed or ground corn. I personally prefer Bob’s Red Mill Grits – they are courser and have a great flavor and texture. There are some instant grits varieties that are processed in the same place as products containing gluten, so be sure to read the label. If you are familiar with polenta, it’s basically the same thing as grits but made from flint corn. They are served similarly. But you’ll find grits in the South and polenta in Italy. I love fixing a breakfast or brunch for a crowd. Probably more than dinner. I set out a variety of homemade and store-bought goodies that people can nibble on in addition to one “main dish” type of thing. That can be a casserole like this one or a sweet, make-ahead french toast. I like serving a salad with greens and fruit and grilled asparagus as well. Here’s a great article on how to set up a simple mimosa bar too. Cook the meats, onions and peppers first so they have a chance to cool a bit before folding then into the grits. You can use your favorite cheese for this recipe – Cheddar, Provolone, Muenster and Monterey Jack are all good choices. Pick a pretty baking dish so that you can set it out on the table to serve. Place the dish on a heated trivet to keep it warm. Preheat oven to 350 degrees F. Grease a 9 by 13 casserole dish and set aside. 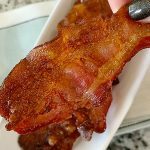 In a large, non stick skillet over medium heat, cook the bacon until about halfway done. Add the onion and peppers and cook, stirring occasionally until the bacon is almost crisp and the vegetables are softened. Microwave the sausage links and chop into small pieces. Add them to the skillet and cook until sausage is starting to brown and the bacon is cooked through. Remove the skillet from the heat. In a saucepan, bring the water and salt to a boil. Whisk in the grits. Lower the heat to a simmer and cook the grits, whisking occasionally for 5 minutes. Remove from heat. 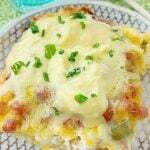 Whisk into the grits the butter, sour cream, creamed corn, beaten eggs and 1 cup of the shredded cheese. Fold in the cooked bacon, sausage, onion and pepper mixture. 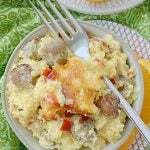 Spread the loaded grits into the prepared casserole dish. Top with the remaining 1 cup of shredded cheese. Bake uncovered for 35 - 40 minutes, or until the casserole is puffed and the top is browning. 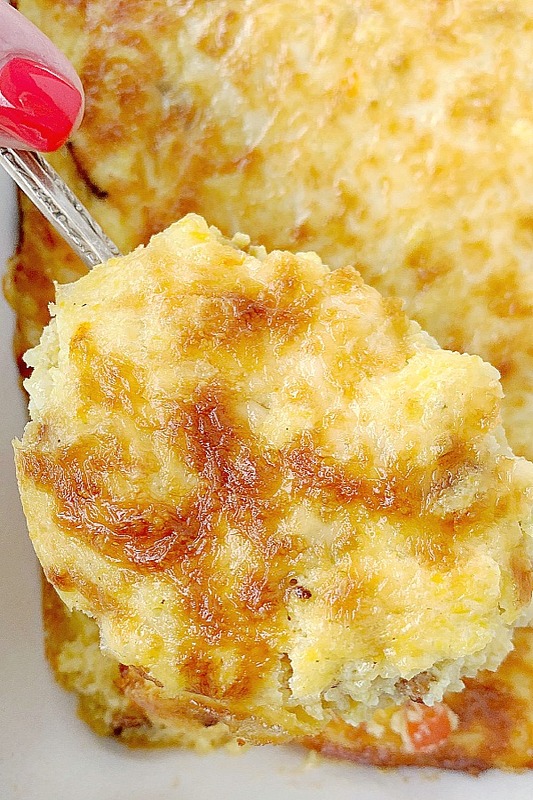 We love grits made but this girts casserole will give a whole new way to enjoy them. This casserole looks so yummy! 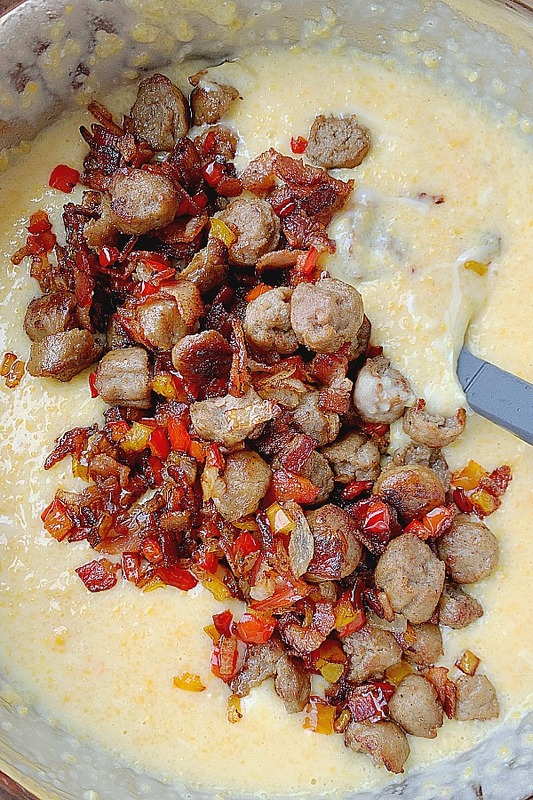 Cheese, bacon, sausage and grits! You can’t go wrong with this casserole. So delicious! Such amazing flavors here! 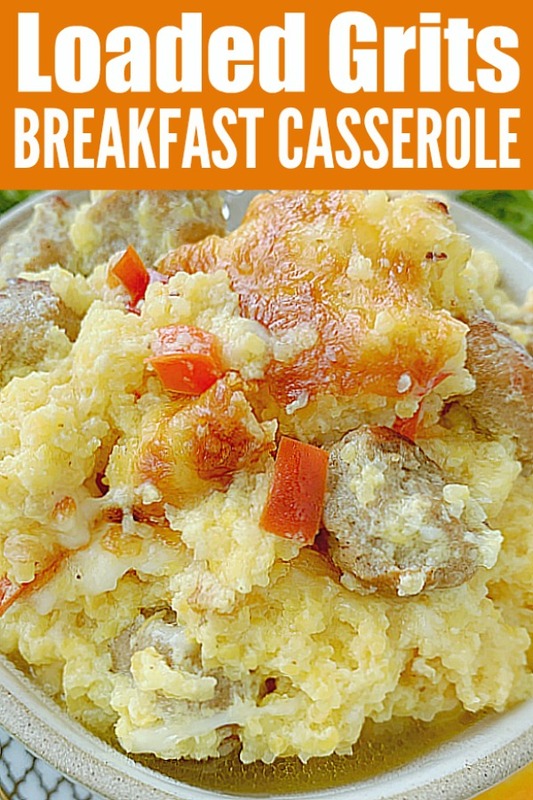 Definitely a fun option for feeding a breakfast crowd – and easy to make! It’s so simple to make. Thank you! I lived in the south for long and have seen the plain grits. Yours looks really so loaded. I would definitely like to try a veggie version. This would be great with veggies too!! This dish is the reason I love brunch food! So savory and so filling!